You are currently browsing the archives for the “Robert J. Sawyer” tag. It all began with Robert A. Heinlein. Back in the 1940s, Heinlein gave what may well be the best writing advice ever given, a five step approach to achieving success as a spinner of tales. And last week at The Penguin Bookshop, an attentive crowd joined me in a consideration of those rules and how they apply to the writing, selling, and adapting of the story “Traumatic Descent” (a.k.a. 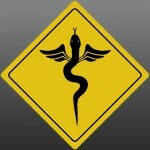 “This Way to Egress”). From the story’s first appearance in Tom and Elizabeth Monteleone’s anthology Borderlands 3, through its numerous reprintings and recent adaptation for Mick Garris’s forthcoming feature film Nightmare Cinema, the story has certainly taken on a life of its own. And it’s a life it never would have had without the steps that RAH outlined some 70 years ago. For the record, here are the rules: You must write. You must finish what you write. You must refrain from rewriting, except to editorial order. You must put your writing on the market. You must keep it on the market until it sells. Over the years, people have followed, argued, modified, and disputed those rules. 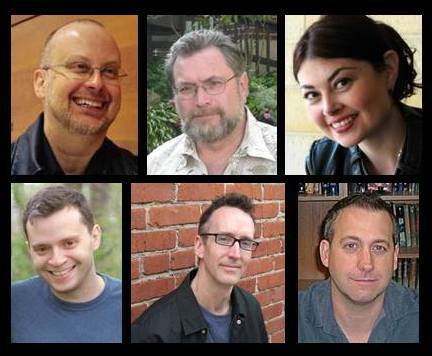 A few years back sf writer Robert J. Sawyer added a sixth, and more recently commentator Charlie Jane Anders disputed them over at io9. Surely, there must be something to them to keep the conversation going for so long. 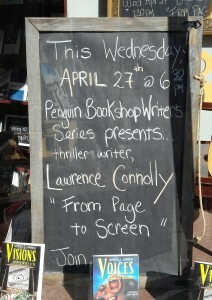 In any event, they’ve worked for me, and I was pleased to have the opportunity to share the reasons with the good people who stopped by The Penguin on April 27. If you were there, you know the story. If you weren’t, you can still join in by clicking the player below. It all begins with a burst of 4:00 am inspiration back in 1988 and continues today with the development of Nightmare Cinema. Guess it pays to follow the rules. Scop on! 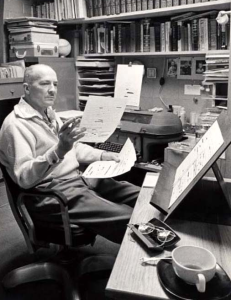 Robert A. Heinlein at work. c. 1965. from patrickmccray.com. Penguin Bookshop window display and podcast photo by Mark E. Connolly, copyright © 2016. Powered by WordPress and delivered in 0.309 seconds using 41 queries.